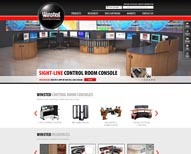 The control room manufacturer, Winsted, has released their new updated website. Winsted.com has been redesigned to include extensive product information to help customers understand the firm’s range of control room furniture. Technical data, video and application case studies work together to provide a detailed overview of Winsted’s capabilities across a range of sectors including Security, Retail and Transportation. The site is compatible with today’s browsers and mobile devices.